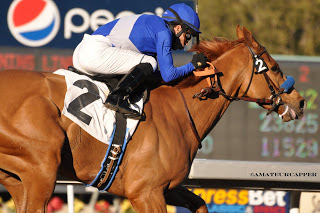 • Broke through in 2013 with his first “big” horse when the extra-rapid Points Offthebench, a California-bred he’d nursed along until the gelding cut loose as a 4-year-old, registered victories in four of five starts, including a pair of Grade I sprint stakes – Del Mar’s Bing Crosby and the Santa Anita Sprint Championship. Next up for the son of Benchmark was to be his role as the favorite in the Breeders’ Cup Sprint at Santa Anita, but one week before that race he suffered a catastrophic injury during a workout and had to be euthanized. • Points Offthebench’s brilliance – and Yakteen’s fine job with him -- were awarded a bittersweet salute posthumously by the racing industry nationally as he was awarded an Eclipse as Sprint champion. He also was honored in his home state by being named California’s 2013 champion older male, sprinter and Horse of the Year by the California Thoroughbred Breeders’ Association. • Prior to Points Offthebench, Yakteen had won stakes with Fortunately, Bench Points, Ingrid the Gambler and Stratham, among others. • Yakteen spent the first 18 years of his life in Germany, the son of a German mother and a Lebanese-born father who had become a U.S. citizen and joined the Army, which earned him an assignment in Nuremberg. Naturally enough, Yakteen speaks fluent German. • But on July 4, 1982 he started a new life by joining a sister who’d moved stateside to Cypress, California, right near Los Alamitos Race Course. • Young Yakteen needed a job and, though he hadn’t had any experience with horses previously, he was willing to learn and started by mucking stalls, first with trotters, then with Quarter-horses. • As he moved up the ranks he hooked up with a Quarter-horse trainer on the rise – a white-haired fellow named Bob Baffert. And when Baffert made the jump to Thoroughbreds in 1988 and 1989, Yakteen made it with him. • Yakteen remained with Baffert until 1991, when he was offered the opportunity to come on board with Hall of Famer Charlie Whittingham. He took it and for the next six years was the Bald Eagle’s right-hand man, highlighted by his direct involvement with the remarkable careers of the multiple-stakes winning mare Flawlessly, Santa Anita Handicap winner Sir Beaufort and a record-setting run by the horse he saddled in the Japan Cup – Golden Pheasant. • In 1997 the timing was right for him to return to the Baffert barn and for the next seven years he helped the future Hall of Famer saddle up the likes of champions Silver Charm, Real Quiet, Silverbulletday, Chilukki and Point Given, along with dozens of other stakes winners. • Yakteen stayed with Baffert through 2004 before going out on his own. “How exceptionally fortunate was I to be able to work and learn under two Hall of Fame trainers,” he says. • Yakteen actually saddled his first winner in 1991 when he was still in the employ of Baffert, who let Yakteen keep a few horses on his own. That inaugural winner was Lady Keeper. • Sent out his first all-on-his-own winner – and initial stakes winner -- when he took Sabiango to the Deuling Grounds (now Kentucky Downs) in Kentucky to capture the 12-furlong Kentucky Cup Turf Handicap. Like his conditioner, Sabiango was a German-bred. • He is married to horsewoman and HRTV commentator Millie Ball, a British-bred who began riding in Europe, then transitioned to California racing in 1995. She and Yakteen became friendly at the racetrack and the couple was engaged in Dubai the night before the 2001 Dubai World Cup where they had gone to oversee the Baffert ace Captain Steve – she as the exercise rider, he as the assistant trainer – for his run in the $6-million race. The horse was a winner and Yakteen and Ball were off and running, too. They have two sons, Sam and Ben.